This new Hubble Space Telescope reveals a dazzling look at the N11 region of the Large Magellanic Cloud — a SATELLITE galaxy near the Milky Way — and was released on June 22, 2010. Aspectacular new photo from the Hubble Space Telescope has revealed a stunningspace bubble filled with baby stars. The new spacebubble image highlights an area called N11 ? a complex network of gas cloudsand star clusters within our neighboring galaxy, the Large Magellanic Cloud. Thisenergetic star-formingregion is the second largest known to date, and one of the most active inour galactic neighbor. 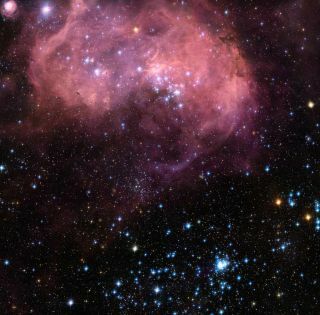 The LargeMagellanic Cloud contains many bright nebula bubbles, though N11 is one of themost magnificent, Hubble officials said. Astronomerstook the new N11 photo using Hubble's Advanced Camera for Surveys, which wasrepaired in May 2009 during NASA's last service call to the iconic spacetelescope. The image is actually a mosaic of five different views observedby Hubble, researchers said. Officially knownas LHA 120-N 11, N11 is one of many nebulas catalogued in 1956 by Americanastronomer Karl Henize, who later became a NASA astronaut. The object'scharacteristic shape earned it a nickname as the "Bean Nebula." N11'sbillowing pink clouds of glowing gas and the dramatic and colorful featuresvisible in the burgeoning nebula are telltale signs of star-formation. Thenebula is a well-studied patch of space that is spread across more than 1,000light-years and has produced some of the most massive stars currently known. Thatstar-formation bonanza actually holds the key to the N11 nebula's gossamerbubble look. Threesuccessive generations of stars, each forming further away from N11's centerthan the last, have created shells of gas and dust that were later blown away fromtheir parent stars. This created the dazzling ring shapes that are so prominentin the Hubble image. Other shapesthat are found in the high-resolution image include the red bloom of adifferent nebula ? called LHA 120-N 11A ? in the upper left. The rose-likepetals of gas and dust in this nebula are illuminated by radiation from themassive hot stars at its center. N11A isrelatively compact and dense, and is home to some of the most recent stardevelopment in the region.? Other starclusters, including NGC 1761 at the bottom of the image, can also be spotted.NGC 1761 encompasses a group of massive hot, young stars that emit intenseultraviolet radiation out into the cosmos. ? By studyingthese busy stellar nurseries, astronomers can understand more about howstars are born and the details of their ultimate development and lifespan. WhyAre Space Telescopes Better Than Earth-Based Telescopes?